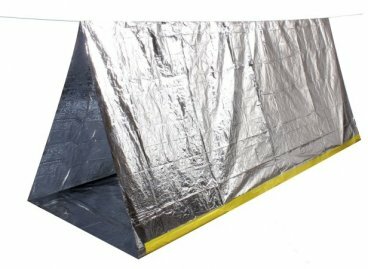 This Emergency Reflective Tube Tent can provide protection from the elements in an emergency situation. It is compact, lightweight, and the reflective material helps to conserve body heat. It's 8' length comfortably fits two people. It comes with cordage to allow you to fashion a tube tent between two objects such as two trees. This is a great item for a survival kit or pack, a Bug-Out Bag, or a vehicle emergency kit. Weighs 6 oz. with cordage.